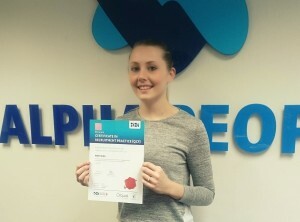 Amber Received Her Certificate in Recruitment Practice! Amber travelled to Bristol on the 2nd of February to sit her exams for the Level 3 Certificate in Recruitment Practice. She had to wait six weeks for her results to come in… Today, she finally received the longed-awaited REC envelope. While her colleagues watched her open it, she let out a brief ‘Yay!’ and we all new that the news was good! Amber may now call herself a Certified Recruitment Practitioner and is a Member of the Institute of Recruitment Practice. Congratulations Amber!